well, it’s been a quiet week here in stockholm, my hometown… sorry, i’ve been listening too much to garrison keillor recently. or can there be too much of garrison keillor? anyway, apart from working, working, working it’s been very quiet here lately. i’ve missed out on several of my ballet and tap-dancing lessons and i’ve not been able to amount enough energy to meet with my fellow knitters at sthlm knitters’ tuesday night knitting at hurtigs konditori. perhaps next week. but i have been knitting. i’ve spent several weeks knitting the odd row on the (seemingly) neverending fisherman’s jumper, hemingway, for stefan. i’m almost at the neck steeks now. 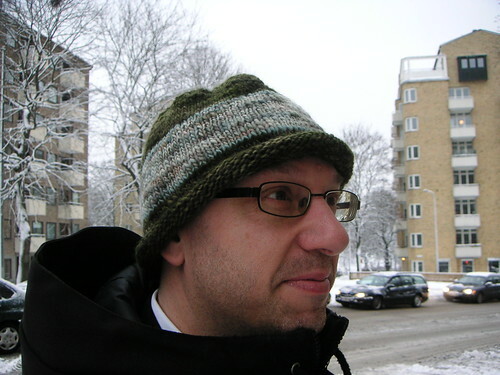 the other week i needed a quick fix, so i knitted another one of those quick and easy hats from last minute knitted gifts. the problem with fitted knits, in my view, is that japel has chosen quite fat yarns, which i’m not very fond of knitting with or wearing. but, my quriosity to try something overcame my waryness. i didn’t want to go out and buy more yarn, since i have quite a lot as it is, so i initially had some trouble finding a suitable yarn. my choice fell on the white 3-ply wool from yllet that was once intended to be hemingway, but has since been discarded and no longer had a designated project. i almost never wear white, and i don’t like this particulary shade of white at all, so my plan is to dye the jumper once it’s finished. i decided on the cosy v-neck jumper, because it’s easy, hopefully quick and well, it’s a v-neck. i wear a lot of v-neck jumpers, so the choice was easy. i ended up in bed all day yesterday due to a cold, so i spent it knitting and watching the last, yes, the very last!, episodes of gilmore girls and have made quite some progress. i’m not fantastically thrilled with the result so far, the change from knitting back and forth around the v-neck to the circular knitting below doesn’t look very good, and the stitches are rather wonky due to the large needles (5 mm! enormous! 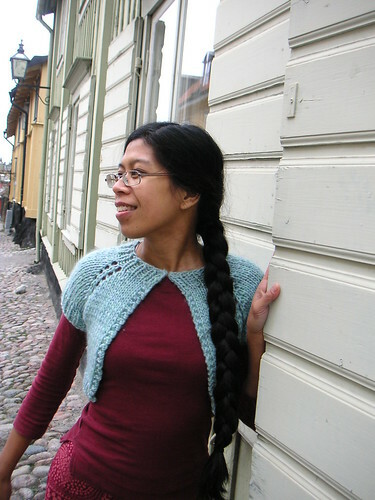 ), but it’s wool, so i’m hoping for a magical transformation when blocking. but it’s fun! and quick! i really enjoy the top-down knitting and right now feel like i must convert all patterns to top-down knitting (i probably won’t, but isn’t it fun to be carried away by something?). i won’t follow the sleeve patterns, because they’re knitted back and forth, which is completely pointless to me, so i’ll knit those in the round too. i’ll probably have to go up one size in needles, though, because my tension is usually much tighter on dpns than on circulars. well, i’ll probably sleep for a bit know, and later knit for a while if i’m up to it.